Sword Art Online 16 is now available up next. The next episode is entitled Land of the Fairies. So finally, ALfheim Online will be introduced in the next episode. I guess I overdid my spoiler during the last episode. Part of it was supposed to be the spoiler for Sword Art Online 16. But at least the information was more or less accurate compared to the anime except for some minor details. If you want to read the spoiler for the next episode, do continue reading below. UPDATE: Sword Art Online Episode 16 is now available. During the last episode Kirito received an email that contains a shocking image. It was a picture of a girl that very much looks like Asuna, except she’s in elf form. But most probably you get the idea, the girl is actually Asuna, and she’s trapped in another VR game. Now what will happen next in Sword Art Online 16? Find out more below. WARNING: From this section forward, this contains heavy spoiler and some brief information on what is about to happen next. 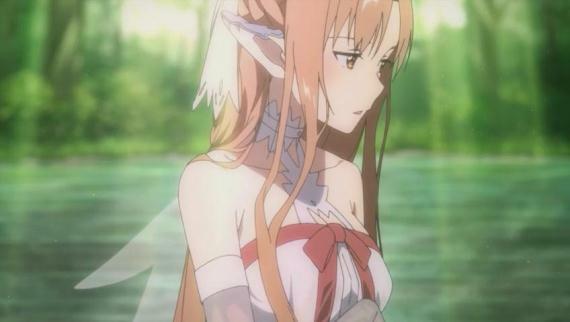 Kirito saw an imaged of an Elfen Asuna. Egil/Agil showed Kirito an interesting image of Asuna being trapped in another VRMMORPG. He also showed to Kirito the new VR technology, the AmuSphere. The AmuSphere is basically like an upgraded or enhanced version of the Nerve Gear. A new company was created while they were still trapped in SAO, so basically they did not have any idea about AmuSphere at all. Egil(Agil) also Kirito about ALfheim Online, where he got the picture of the captured Asuna. It’s a new VRMMORPG like Sword Art Online except that it’s more of an Elf-themed game. ALfheim means “Elf Home“. In ALfheim Online the skill system is extreme. Players are encouraged to do PKing (player killing). But if you die in this game you can still be revive and you won’t be trapped in this game, unlike in SAO. Agil further explained that ALfheim Online relies on the player’s own athletic skills and not on a character’s class. The great thing about ALfheim online is that the player has the ability to fly, (as you have probably seen during the intro MV). Kirito wants to play ALfheim Online to confirm something. He wants to try and save Asuna whose consciousness is still trapped in a new VRMMORPG. Kirito suspects that his fiancé Sugou Nobokuyi is behind this and he might know why Asuna is still not awake. Sword Art Online 16 marks the beginning of a new journey for Kirito, her sister and Yui. I’ll updated this post once Sword Art Online 16 is released. Stay tuned!